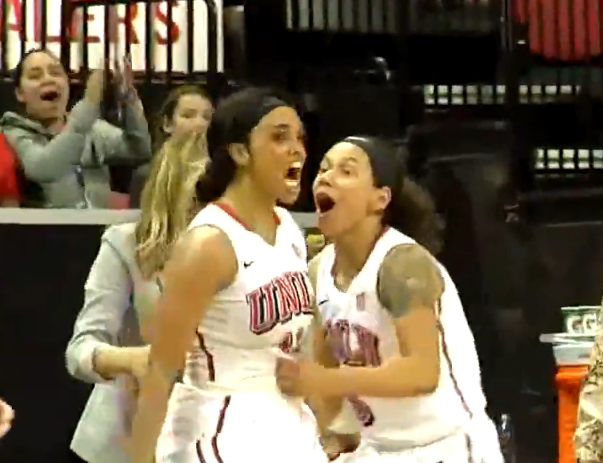 Junior guard Dakota Gonzalez scored 17 points and had a Mountain West Tournament record eight steals and junior guard Brooke Johnson added 17 points and a school tournament record five 3-pointers to help lead the third-seeded UNLV Lady Rebels to a 68-43 quarterfinal victory over No. 6 seed Utah State on Tuesday night at the Thomas & Mack Center. The 25-point margin of victory was the largest ever in a Mountain West quarterfinal, easily surpassing the previous high of 18 points set by Boise State against the Lady Rebels (64-46) in 2015. Sophomore forward Paris Strawther scored 14 points and grabbed seven rebounds and junior guard Dylan Gonzalez added 12 points for UNLV (22-9) which will face No. 7 seed Fresno State (17-14), which upset second-seeded Wyoming, 58-48, in the semifinals at 9 p.m. on Wednesday night. The Lady Rebels finished with 13 steals and forced 17 turnovers. Fresno State defeated UNLV, 66-60, last year in the semifinals, but the Lady Rebels won the only meeting this season, 54-38, last Friday at Cox Pavilion. Top seed Colorado State (24-7) will play Boise State (23-7) in the other semifinal at 6 p.m. The winners play Friday at noon for an automatic berth to the NCAA Tourney.